In March 2019, Seshat researchers published their first Nature paper, entitled Complex societies precede moralizing gods throughout world history. The article makes use of a combination of previously used and newly released Seshat data. Both the data and code are open access. As Seshat is very much a continuously evolving ‘live’ project, we very much welcome comments and additions. We have published comprehensive instructions on how to engage with our data. The global distribution and timing of beliefs in moralising gods shows that they appear in complex societies. The area of each circle is proportional to social complexity of the earliest polity with moralizing gods to occupy the region or the latest precolonial polity for regions without precolonial moralizing gods. For regions with precolonial moralizing gods, the date of earliest evidence of such beliefs is displayed in thousands of years ago (ka), coloured by type of moralizing gods. Whitehouse, François, Savage et al. (2019) Nature. The article is built upon the Seshat methodology as detailed in both the Seshat: Global History Databank and the Macroscope articles. Following our article focusing on Axial Age hypothesis, this article too focuses on a Big Question about general patterns in human history and tests the explanatory power of alternative hypotheses. Papers focusing on other Big Questions, including the roles of human sacrifice, agriculture, and warfare, are in progress. Our Nature article has attracted extensive media coverage. Some of these articles can be accessed through our webpage. Below you can find further information on key aspects of Seshat and links to comprehensive information on these aspects. Seshat is the name of the Ancient Egyptian goddess of, amongst other things, knowledge and record keeping. As our database is a massive storehouse of historical and archaeological data that we utilize to construct a deep understanding of change over time, Seshat is an ideal patron for our project. Why did you decide to create Seshat? Seshat is designed to be the premier port of call to test social sciences theories or address Big Questions with historical and archaeological data. A lot of historiography is hampered in varying degrees by the cherry-picking problem (i.e. it is very difficult to demonstrate the bias-free nature of the selection of a few chosen historical examples as evidence for a specific theory). Seshat was designed to overcome this limitation by organizing a vast amount of historical and archaeological data on over 2,000 theoretically motivated variables for a stratified sample of past polities and quasi-polities. The latest weekly download “scraped” 279,756 Seshat records of 1728 variables coded for 996 polities in 49 NGAs. Analysing the Seshat data allows users to overcome this cherry-picking problem and to utilize a scientific approach and workflow when adjudicating the explanatory power of different theories and hypotheses. Another innovative feature of Seshat is its temporal dimension: the Databank follows how cultural characteristics of societies change with time. When we observe a high degree of correlation between two variables in a synchronic data set (one that lacks time depth), it is difficult to determine which of the factors is the cause, and which is the effect. A huge advantage of dynamic Seshat data is that it enhances our ability to test rival hypotheses about the evolutionary processes that generate cultural change. Finally, Seshat is not designed in opposition to traditional narrative historiography but as a complementary way to enrich existing historiography by providing a robust comparative angle. In fact, the vast majority of contributors to Seshat are humanities scholars. Who is involved with Seshat? The Seshat: Global History Databank was founded in 2011 by Peter Turchin (UConn), and Harvey Whitehouse and Pieter Francois (University of Oxford). Since then the team has grown rapidly and over a hundred collaborators have contributed to the project. These collaborators include postdoctoral researchers who oversee part of the data collection and co-lead on testing specific predictions, research assistants who gather the data in consultation with domain experts and postdoctoral researchers (our Nature article was co-led by postdoctoral researcher Patrick Savage, now an associate professor at Keio University), Seshat staff who help with project management and maintaining the data infrastructure, and domain experts who guide the construction of the Codebook, work alongside the research assistants and vet the Seshat data. Our domain experts come from a range of academic disciplines, including history, archaeology, anthropology, and area studies. A comprehensive overview of the various roles and contributors can be found on our ‘Who We Are’ webpage. The Seshat project has received generous funding from a range of funding bodies and philanthropists. Details can be found on our Acknowledgement webpage. What were your main findings and how did you arrive at them? 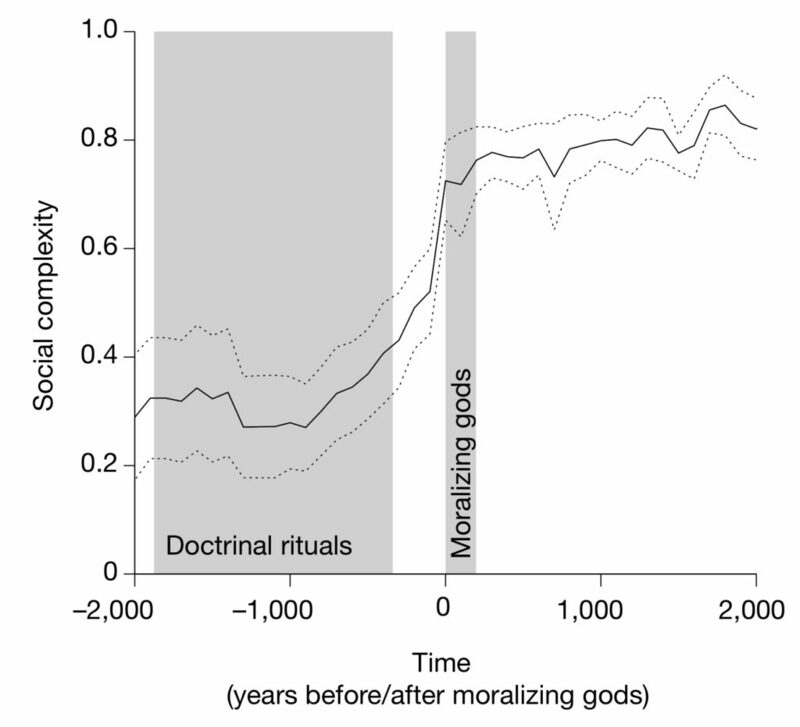 Our main finding was that belief in moralizing gods followed the expansion of human societies, rather than being pivotal for the evolution of social complexity. In recent millennia there has been a rise in the spread of ‘prosocial religions’, in which either powerful ‘moralizing gods’ (which enforce a moral code) or more general supernatural punishment of moral transgressions (for example, karma in Buddhism) have been postulated. Although previous research has suggested that there is an association between the presence of moralizing gods and social complexity, the relationship between the two is debated. We analysed standardized Seshat data on social structure and religion for hundreds of societies throughout world history to test the relationship between moralizing gods and social complexity. We coded records for 414 societies spanning the past 10,000 years from 30 regions around the world, based on 51 measures of social complexity and 4 measures of supernatural enforcement of morality. We found that belief in moralizing gods usually followed the rise of social complexity and tended to appear after the emergence of ‘megasocieties’, which correspond to populations greater than around one million people. We argue that a belief in moralizing gods was not a prerequisite for the expansion of complex human societies but may represent a cultural adaptation that is necessary to maintain cooperation in societies once they have exceeded a certain size. This may result from the need to subject diverse populations in multi-ethnic empires to a common higher-level power. How did you deal with disagreement about how to interpret the historical evidence? Disagreement among experts on data and its interpretation is a key and valuable characteristic of most humanities research. Removing this disagreement from the Seshat data would constitute a major loss. Hence, capturing levels of both uncertainty and scholarly disagreement is part of the Seshat philosophy. Firstly, the relevant wider historiographical debate is captured in the accompanying textual paragraphs to each Seshat record. Secondly, levels of disagreement are also included in the machine-readable part of the data and these are incorporated into the analysis stage. In particular, we utilize multiple imputation, an analysis technique by which we re-run the analysis many time randomly substituting different possible or disputed values each time, allowing us to quantify the degree to which scholarly disagreement impacts our results. We found that such disagreement had no effect on our primary finding that complex societies precede moralizing gods. Why did you use reductive measurements of social complexity and moralizing gods? Although science requires some level of reductionism in order to test hypotheses, our study measures social complexity and moralizing gods in greatly more detail than most previous research on this topic, much of which used simple measures such as presence/absence of a moralizing high god or classified societies as either “high” or “low” complexity. Instead, our analysis is based on 51 measurements of social complexity and 4 measurements of moralizing gods. It’s true that some researchers use more sophisticated measurements involving things like performing experiments to measure degrees of belief in moralizing gods, but these can only be done for contemporary societies. We can’t go back to ancient Egypt and ask the people how much they believe in Maat’s power to punish their misdeeds in the afterlife. Our approach goes far beyond the state of the art in terms of measuring the coevolution of religion and social complexity throughout global history. Why didn’t you wait to publish until all data points had been verified by a recognized world expert? Our paper analyzed almost 50,000 records across 10,000 years of world history. It is simply impractical to require busy professors to verify each of these records. Instead, we rely on highly trained research assistants to do the initial coding and consult with expert professors as much as practically possible (http://seshatdatabank.info/expert_reflections/). Dozens of such experts have contributed to this process so far (http://seshatdatabank.info/seshat-about-us/contributor-database) – including four who are coauthors on our paper – but rather than relying on them as the ultimate source of authority of our data, we rely on the data itself (publicly available at seshatdatabank.info/data), including detailed references and citations supporting most records. Our website also allows us to incorporate disagreement among experts and to continually update it as new information becomes available. In our view, the idea that expert vetting assures quality is based on an outdated philosophy from the pre-digital-humanities era, whereby a recognized scholar writes an authoritative book or paper and their statements are then frozen for all time. Instead, Seshat is a living, evolving database in which we are constantly updating our records and routinely documenting changes so that actions and sources are traceable. Not all data in Seshat needs to be checked by an expert, e.g. if the information is well-established and uncontentious. We direct expert attention mainly to areas of uncertainty or where there are problems of interpretation. How did you control for past historical relationships like the spread of Christianity or Buddhism among the societies you study? We control for past historical relationships in several ways. First, the initial sample of 30 geographic regions was selected to minimize such relationships. Second, we use logistic regression analysis to explicitly account for geographical, historical, and cultural similarity. Finally, we re-run the analyses separately for each region for which matching data on social complexity was available both before and after the appearance of evidence of belief in moralizing gods, finding that our results were consistent in all 12 such regions. Is it possible that moralizing gods actually caused the initial expansion of complexity but you just couldn’t capture that until societies became complex enough to develop writing? Although we cannot completely rule out this possibility, the fact that written records preceded the development of moralizing gods in the majority of the regions we analysed (by an average period of 400 years)—combined with the fact that evidence for moralizing gods is lacking in the majority of non-literate societies— suggests that such beliefs were not widespread before the invention of writing. Given that gods who care about whether we are good or bad arose too late to have driven the initial rise of civilizations, we are now looking to other factors that may have driven the rise of the first large civilization. For example, Seshat data suggests that daily or weekly collective rituals (the equivalent of today’s Sunday services or Friday prayers) appear early in the rise of social complexity. Such practices may have allowed new beliefs and practices to spread to, and become stabilized within, much larger populations than had previously been possible. But such a method holding together large societies would have come under stress as new territories were conquered and their peoples absorbed. As multi-ethnic empires emerged, unity based on a common set of rituals may not have been enough but could help to explain the need for moralizing gods at this point in social evolution. If the original function of moralizing gods in world history was to hold together fragile, ethnically diverse coalitions, what might declining belief in such deities mean for the future of societies today? Could secularization in Europe, for example, contribute to the unravelling of supranational forms of governance in the region? If beliefs in big gods decline, what will that mean for cooperation across ethnic groups in the face of migration, warfare, or the spread of xenophobia? Or are the functions of moralizing gods simply being be replaced by other forms of surveillance? Even if Seshat cannot provide easy answer to all these questions, it could provide a more reliable way of estimating the probabilities of different futures. For a more extended discussion of the wider context and significance of the study, see this article in New Scientist.